Our Texas certified real estate appraisers provide residential and commercial appraisal services throughout the Gulfgate market for both independent use and lending usage. Our philosophy is to supply our customers with a quick, reliable and comprehensive appraisal report that meets or exceeds their expectations and requirements for use. We have some of the most competitive appraisal fees in the area and take pride in delivering completed assignments faster than the average firm. Our staff of appraisers are all local to the Houston area and are competent in performing appraisals for varying property types, for any purposes including residential, commercial and mixed-use properties. For commercial jobs we only employ Texas Certified General appraisers with a minimum of 10 years of experience in the Houston market. Whether you need a home appraisal report for lending, private use or a legal issues, our appraisal services will work for almost any real estate valuation needs. We are dedicated to providing competent, friendly and expedient services to all our customers be it homeowners or industry pros. If you have any questions or you’re ready to request an appraisal, please call the phone number on this site or complete the appraisal order form found on this site. 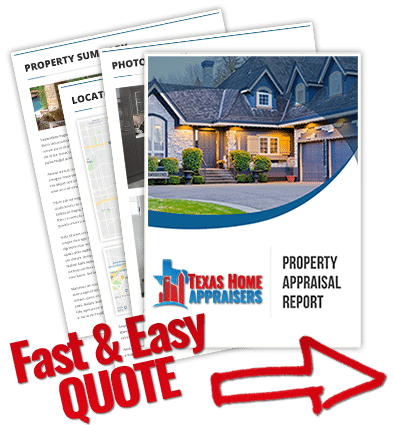 Do you need a residential houston property appraiser today? Call us or complete our online quote form and we’ll help you right away. Do certain improvements add more value than others? When assessing the value of a home, an appraiser will take into consideration large improvements such as upgraded flooring throughout a home, high-end appliances, modern countertops, bathroom updates, extensive crown molding, covered patios and outdoor kitchens, and additional garage count. Because some improvements may cost more to implement than they can add to the value of a home, it is more beneficial to have a local real estate appraiser provide a cost/benefit analysis rather than assuming the owner’s tastes will conform with the current market trends. Will the appraiser show the appraisal report to the seller? If they did not order it, then no. The seller will only get a copy of the appraisal if the borrower wants to share that report. In most cases a seller will not get a copy of the appraisal unless the value did not meet the sales price, at which point the buyer may choose to share the appraisal to help in renegotiating a lower price. The appraisal is higher than the sales price. What happens now? Lenders will typically use the sales price or the appraised value, whichever is lower, the set your LTV. So long as the appraisal comes in the same, or higher than the sales price everything is ok. The good news is that you now have built in equity in the home. It’s also worth noting that the sellers do not get a copy of appraisal so they don’t know that the value came in higher BUT even if they did find out they cannot increase the purchase price since the contract already notates the terms. Are Realtors allowed to contact appraisers? That depends on the discussions. Realtors can provide additional property or transaction information but the appraiser will not be allowed to discuss any details concerning the appraisal. If the Realtor is the client who engaged the appraiser then they may discuss any and all details pertaining to the appraisal process.